I have given myself ten days to savour this new year and so far I can say it tastes a bit like a yoghurt that has just slightly turned. Or wine that you’re not sure is corked or just a bit weird. Or a nearly-but-not-quite stale biscuit. I’m not sure why these things spring to mind. I think it’s the feeling of looking forward to a fresh, new start, and then realising I need some new spark plugs if things are going to go anywhere. I began this year with a damaged coccyx, which rather puts a damper on anything involving sitting down, moving from sitting down to standing up (and vice-versa), and picking anything up. Which, I discovered, is most things when you are the mother of a 5 year old and a 2 year old. I am proud to say it was the result of a motorbike accident. Yes, me, the daring, racy motorbike rider, all leather and denim and long blonde hair in the wind. 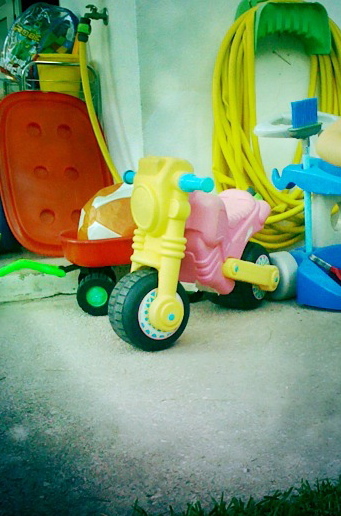 I am less proud to say the motorbike is about 50 cm high, pink and yellow and made of plastic. It is a fine source of amusement for those between 2 and 7 as they race down the concrete drive at 90 mph and onto the lawn. Tommy was managing to pick up enough speed to go right round the tree at the bottom of the lawn. It looked like such fun I thought I’d have a go. And it was fun, really fun, all the way down the drive, the kids and I screaming with laughter… until I hit the bump which leads onto the lawn. The motorbike went up, so did my bottom, and then came crashing back down onto the plastic saddle which has a little upward curving protuberence at the tail-end. In flight, my own tail-end shifted backwards a couple of centimetres, only to meet whackingly with the knobbly bit. In terms of pain I would rate childbirth as the most painful thing I have experienced, followed by toothache and ear infections, followed by this. I have never ever hurt this part of my body so it was a surprising pain as it made me realise that bit of my body really REALLY exists. This happened on Christmas Eve. For two weeks I couldn’t sit down properly. I had to twist sidewards or lean right forward. We had a long drive back from Barcelona during which I hung on to the passenger seat handle above the door and swayed my way home. We went straight to a friend’s surprise birthday party. She is an osteopath and told me to get it checked out straight away as it’s easy to break or fracture your coccyx without realising. There’s not much you can do about it except let time heal the bones, but if you know it’s broken or fractured you should take it really easy. This was the perfect excuse to get out of the house and read one of my Christmas books so the next day I drove to E&R and spent a few hours standing in a waiting room (still too painful to sit) and then had a x-ray done. Result: no broken bones (hoorah), but the coccyx had been “twisted” (yikes). The doctor explained it’s like twisting your ankle and that once the inflammation goes down it all goes back to normal, but could really benefit from an osteopathy session. Great, I thought, I’ll just see my osteopath friend as soon as possible. Alas, she doesn’t ‘do’ the coccyx. The look on her face worried me. “What does ‘doing the coccyx’ involve?” I asked. She winced. “Interior intervention.” Ah. “You mean, finger up the bum?” She nodded. I winced. I have found an osteopath who ‘does the coccyx’. Thankfully, for the moment, L’Homme is away for 10 days so I can’t book an appointment as I don’t really want to take Léonie with me while having someone wiggle their finger up my bum. In fact, maybe I’ll keep on finding excuses until things heal all on their own. In fact, my coccyx already feels much better. No, I’m NOT perching on the edge of my chair to write this. Honest. ish. Another reason for not starting this year on jet-skis is illness descending upon both kids and me (it’s a family tradition to be really poorly for the first ten days of the year) and my friend Bernie slowly vanishing into the afterworld; wherever that may be. I’m not going to write much more about him right now as I’m not ready to, but I am thinking of him constantly at the moment, as he slips from here to there. Another brilliant, beloved soul who doesn’t deserve to go so soon. It is 9:30 pm and Léonie (age 2) is leaping around the kitchen singing “Mummy, Mummy, MUMMYYYYYYYY, woter, woter WOTERRRRRR”, whilst tossing a sippy cup in the air and biting through the skin of a banana, sideways. Tommy is asleep on the sofa having had a worm intervention earlier on in the evening (me, Doc. Harrison-Bullett, P.H.D. in Worms – I won’t go into the details). I should carry them both up to bed but my coccyx won’t take it. Welcome to my world, 2013. The motorbike on which I had my Christmas Eve accident. This entry was posted in children & parenting, Christmas, emergencies & accidents, illness, single parenting by inagainoutagain. Bookmark the permalink. Things are healing. At last. I can sit down without looking like a duck. Can I just say, I once (rather drunkenly, so we’re talking a looooong time ago) accepted a backie on my friends bike all the way through Hyde Park on a cold November night and RUINED my coccyx for the next 6 months or so. Every once in a while, after a few months once the main pain had gone away, I’d go to sit down on a bus, or cinema or at a restaurant table and suddenly SCREECH and nearly hit the ceiling for the quick flash of pain. 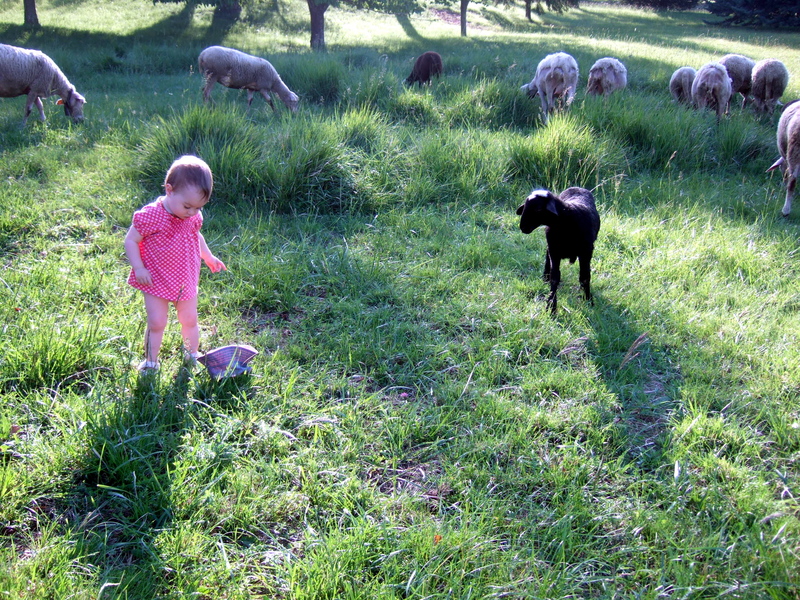 That went on for about 6 months – possibly even 9 – and then it calmed down. So I feel your pain Clazza – it will go though, eventually. And no one – but NO ONE, stuck their finger up my arse.